What a brilliant idea it was to split a community shared agriculture box from Cropthorne Farm. And I think the strategy of alternating weeks, rather than splitting each box is going to work out just fine too. In fact, when I read the CSA’s email about this week’s box, and saw garlic scapes in the mix again, I was delighted on two counts: it’s your week for the box, and it’s the last week of garlic scapes. There’s the rub with eating local: if you want the joy of saying “that came from our farm,” then you have to like what grows there. As satisfying as they are to look at – curvy green snakes! how cool is that? 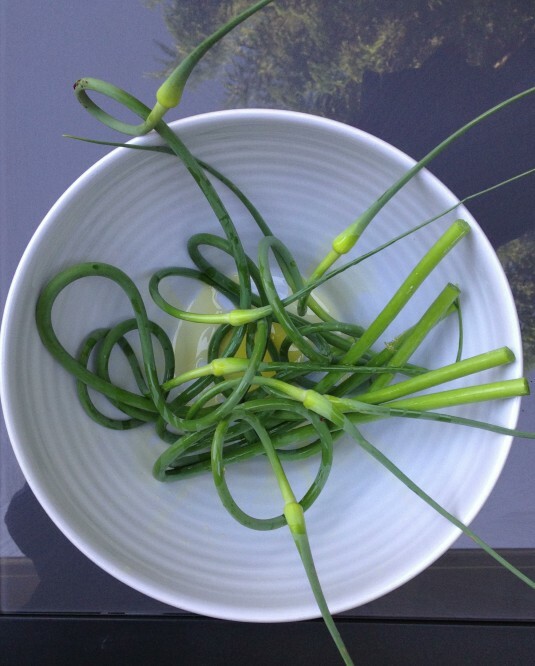 – I can easily wait a year before eating garlic scapes again. They’re okay, just underwhelming. Ah, but the beets, that was another story. I roasted them – four medium sized beets – the day I picked up the box – and served one still warm from the oven as the delicacy it was, cut into segments, and sprinkled with a little salt. We could have just eaten them like that. But I wanted to expand my repertoire of beet recipes. 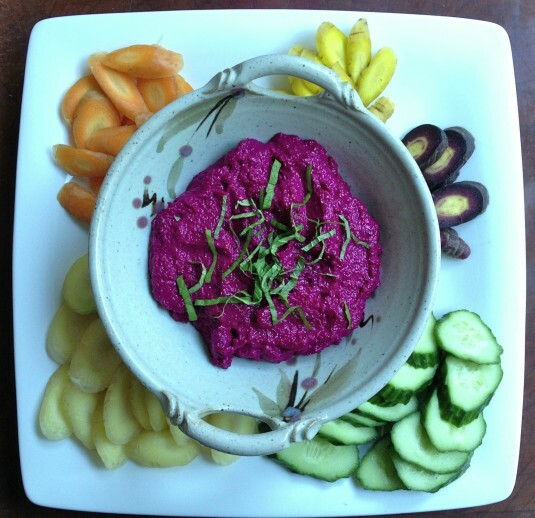 Remembering your parsnip hummus, I searched for beet hummus recipes and found the Minimalist Baker’s – just one beet, and a 14-ounce can of chickpeas, but still proof-positive that someone had made beet hummus and liked it enough to post it. We agreed that more beets would be better and ditched the chickpeas. There was a lot of tasting – at first I put in too much tahini, which had to be balanced with more lemon – but in the end it was very good indeed. Three medium beets turned into what seemed like a very large quantity of hummus. We ate all but half a cup before dinner, with fancy carrots and cucumber, both from the CSA box, and tonight I finished off the last of what was left, making pretty canapés with a Cropthorne cucumber and mint from the back deck. And yes, I’m happy to say that the beets came from our farm. Bob, your best beloved, made so many puns, so steadily all night that I can’t remember if “Hard to Beet Hummus” was his best line or not. As a recipe title it is, indeed, hard to beet. Allow at least an hour for roasting the beets – even better, roast them the day before. To roast the beets: Preheat the oven to 375 F. Scrub the beets and trim off greens and long roots. Toss the beets in a teaspoon of olive oil, enough to coat, and season with salt. Cut a large piece of aluminum foil, enough to make a sealed package that will hold your beets. Place the beets on a baking sheet, and roast for an hour, then check for doneness. A knife should easily penetrate through the beet. Set aside to cool. when the beets are cool enough to handle, remove the skin. It will rub off easily. 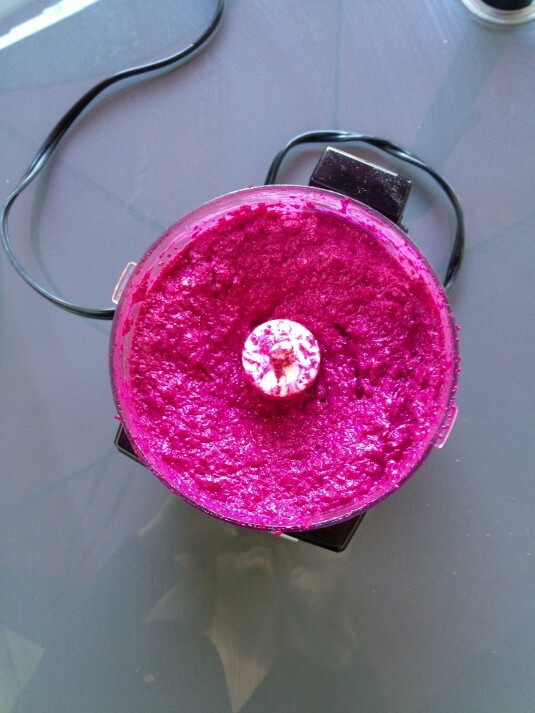 In a food processor or blender combine beets, garlic, tahini, olive oil, lemon juice, salt and pepper. Blend until you have a smooth paste. Taste and adjust for seasoning. This recipe sounds fantastic. And, oh my goodness, the photos are divine. I can hardly wait to make it! I liked it so much I even found myself using it as a spread for a grilled chicken sandwich. 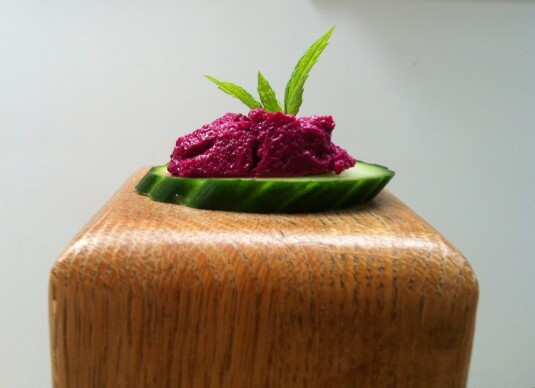 Could be addictive. . . .
Eve: I need to give you and Kris my Swiss friend, Marianne’s recipe for beet risotto – it’s delicious and such a rare and beautiful colour for risotto. The only problem is it’s in metric – help!